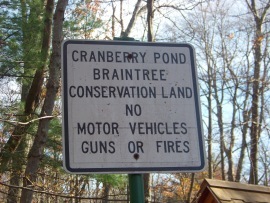 The hiking trails of the Cranberry Pond conservation area are tucked away off Liberty St at Braintree's southernmost border. Only mention of these seem to be at a power sub station on that street near the Holbrook town line. Not many would want to park at the power station and start their journey there! But....if you are able to find the kiosk on Hillsdale Ave.
a marsh, a pond, a stream, and two quaking sphagnum bogs. Quaking Sphagnum bogs!!!?? What are those? Quaking Bogs are formed on shallow ponds by roots and rhizomes of plants that form a mat across the pond that create an unstable surface (you can't stand on it) and quakes (or ripples). 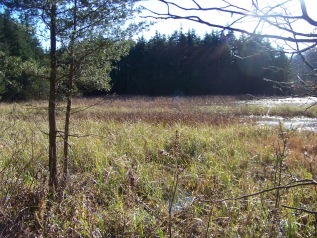 Quaking bogs can evolve into swamps or marshes. Sphagnum bogs form a thicker carpet of sphagnum or layers of peat. Low shrub such as cranberries can grow on this type of mat. The really interesting part of this is that the water quality inhibits decay. Any kind of organic material that falls below this mat can be preserved for thousands of years! One website used for research on this subject said that stepping on this bog is extremely dangerous. The contents of debris at the bottom can be so deep that getting out is impossible. 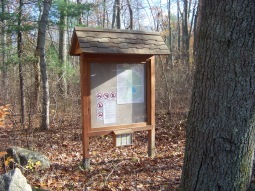 The trail map does ask for visitors to stay on the marked hiking trails. One good reason for doing so! 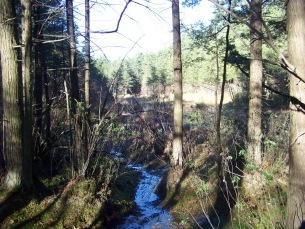 A common feature in bogs is that the water is naturally extremely acidic and low in nutrients. This makes a habitat for some rare plant types. 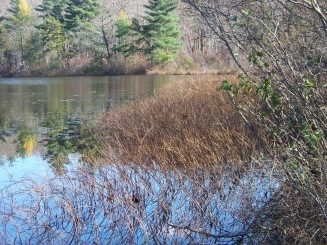 At Cranberry Pond, two carnivorous plants grow here, the Sundew and the Pitcher plant. 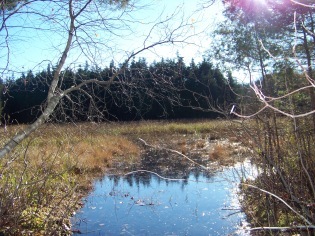 The pond is surrounded by Atlantic White Cedar and Chestnut Oaks that are said to be unusual in Massachusetts. Take note....these quaking sphagnum bogs are not part of the actual Cranberry Pond, though their waters may flow into the pond. 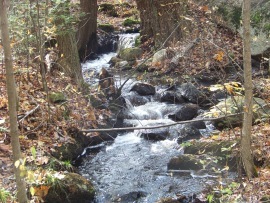 The state calls this area the Cranberry Brook Watershed and is considered to have high quality water. It helps feed the larger Ricardi Reservoir. 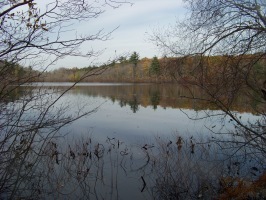 This reservoir provides water for the towns of Braintree, Holbrook and Randolph. 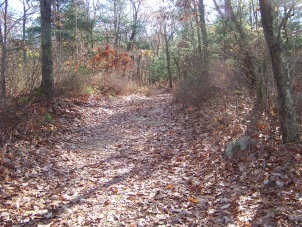 One access point for these hiking trails could be at the parking for the Holbrook Town Forest on Park Dr. in Holbrook. 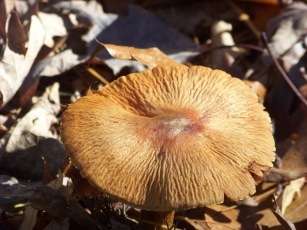 The hike through that town forest is about half a mile using the main trail (Wiggins). Once out to the power lines take a right and Cranberry Reservation will enter on your left. 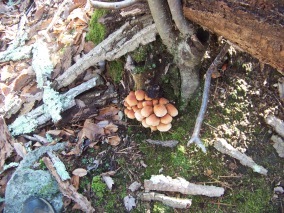 This is the closest entry point to the pond and Cranberry Brook. a one way. 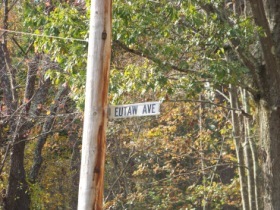 Following it and taking a right on Braemore and then left on Hillsdale ave, you will also see the sign for Eutaw ave at this intersection. hidden roads you will find a hiking trail entrance with a kiosk and a trail map (usually well stocked). When I journeyed through the area the kiosk was full of maps. 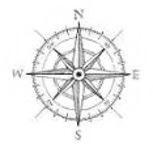 Or you can just use the map to the right in the Trail Quick Facts! It is packed gravel and currently has deep ruts through it. It would be difficult to navigate for a vehicle that rides low to the ground. The trail map also shows a trail entering further down on Braemore St. This is located across from Aspinwall st. You will need to park on the side of the road but it is a very low traffic area really almost no traffic, so no worry here. are two portions to this street and they do not connect. Starting from either of these locations the hike to Cranberry Pond is a bit more of a distance. These two entrances are not far from each other so making your hike a loop from here is a possibility and the one I chose on my exploration. 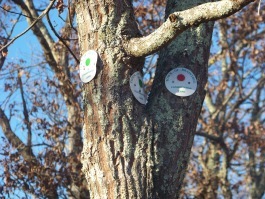 These hiking trails are much like other town conservation areas, they are marked by town conservation disks and colored dots. My route was the red dot trail to the yellow dot down to the pond. From there I took the more difficult blue dot hiking trail around the rest of the pond, to one of the power lines and eventually coming out to braemore rd and walking back down the street to my vehicle. From the Kiosk on Hillsdale and Eutaw the trail shortly afterwards travels over a bridge. 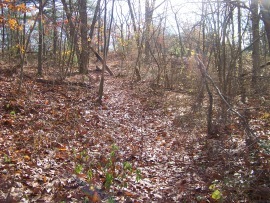 There is a faint trail to the right that leads up to an area that overlooks a small pond that is also shown on the map. 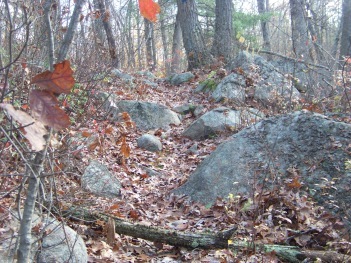 If you follow over the boulders you will find that it is a bit of a shortcut to the main hiking trails. Not long after this shortcut trail you will find yourself at an intersection of trails. 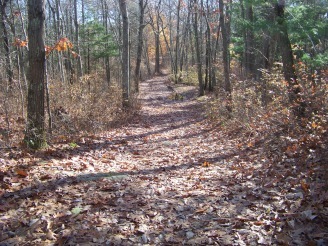 The trail to the left leads to the Devon Wood entrance road. 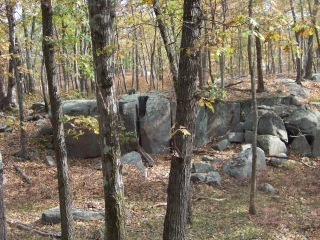 It is quite interesting as it goes thru an area of large boulders and the trail leads over some of these. It is a short diversion if you have time to explore. Parking at this access trail is not suggested. The grass along the roadway is well maintained and there is no space for parking. Back in the conservation area the red dot trail goes to the right. In a short time you will pass by the shortcut path's other entrance. 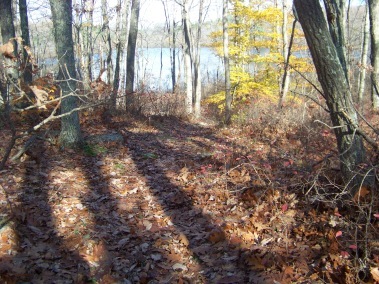 The hiking trails at Cranberry Pond Conservation are cart paths with the exception of the white dot trail. That is true trail sized path. Most of the hiking is easy with some rockiness to watch for. The big exception is the part of the blue dot trail near the pond. though overall the blue dot is still fairly easy. 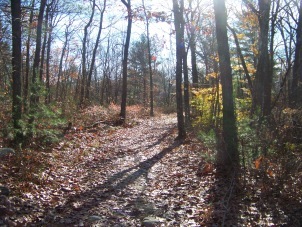 The red dot trail takes a wide sweep around Cranberry Pond and intersects with other hiking trails that will take you directly to the pond. On my initial hike I passed by the white dot trail as it was narrow, preferring the wider yellow dot. Both of these trails go to the right and take you on a more direct course to the pond. The yellow dot continues as a cart path. At the half way point on this trail, the orange dot trail will blend into this trail. On the map the orange dot trail looks like an extension of the red dot trail but you will find orange circles in paint here on this portion. Shortly after this intersection you will see faint trails leading off to the right over large rock outcroppings. 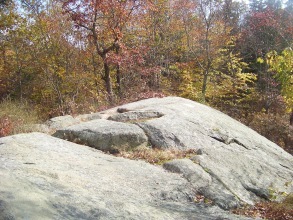 In the fall these rock formations overlook Cranberry Pond with slightly obstructed views of the pond. In the summer most likely these views are completely obstructed with foliage. 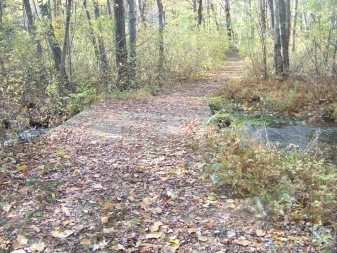 The main trail leading down to the pond and the blue dot trail takes a hard right and follows down to the pond. Do not confuse the trail with water runoff places created in storms. The trail is clear of any debris. There is a good viewing area of the pond at the bottom of this trail. The blue dot trail picks up here and is narrow at this point. this trail becomes more moderate and rocky. 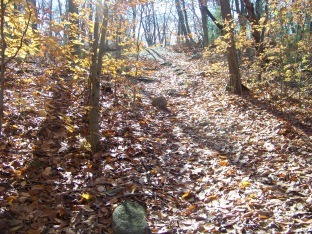 There is a point where a high ridge forms above the trail and a faint alternate route up this ridge. This would be a fairly difficult climb as it appears to go up mostly a rock face. The faint trail goes to the top of this ridge and along the top and leads back into the blue dot trail. 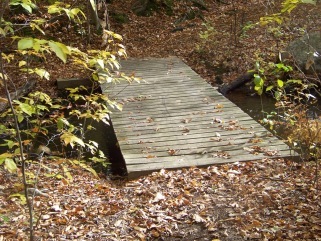 You will soon find yourself at Cranberry Brook and the bridge that crosses it. 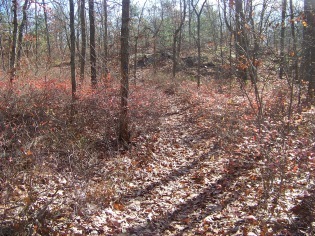 This is a junction of several trails. You can follow the green dot trail up the hill that will bring you back to the red dot trail. 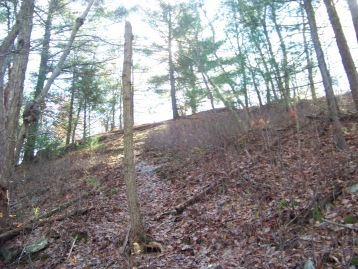 Left brings you back to the kiosk or you can follow the red dot trail out to the utility line going right and find the connecting trail to the Holbrook town forest on the left of the power line. I continued over the bridge following the blue dot trail to make a circuit around Cranberry Pond. The trail soon splits in two. 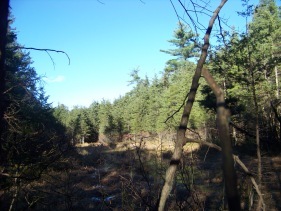 One portion leading to higher ground and another one that follows close to the pond with joining trails that lead out to the pond at the other end with more good views. 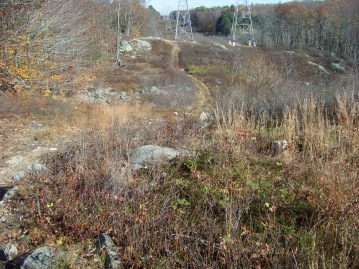 This hiking trail soon comes out to a power line and crosses once again the Cranberry Brook. It will then cross over to the other side of this power line and follows a dirt road. Many power lines on the south shore can be fairly rigorous to hike, not extreme but hilly and this is much like any other on the south shore. Usually good for mountain biking. The trail will soon take a left back into the forest. The map shows a only slightly curving trail on this portion back to Braemore Rd., but I found that the trail took more of a hard right at one point and it was not immediately noticed. I soon found myself at that point and felt I had lost the trail. I had to back track and then noticed the turn. I found the markings and the trail in general at this point hard to follow as the trail was narrow and not as well maintained as other parts of the conservation area. This route in total was about 2 1/2 miles in distance. About 2 hours should be allowed to follow this route and for exploration. 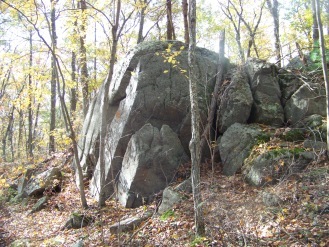 One good reason to hike in the fall when there is little foliage is being able to view the many rock outcroppings in the area. Many times I found myself exploring as I wondered if there may be caves in these formations. 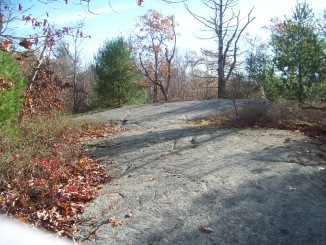 Cranberry Pond Conservation Area has many of these formations and higher elevations that make it an interesting place to visit! from Boston take route 93 south and route 3 at split. Take exit 16 route 18 south. Right at next intersection onto West st. This becomes Grove at Braintree line. Follow til intersection with Liberty st. Left at Liberty. Old Liberty will be approx. 1 mile on left. Take the one way to Braesmore and turn left on Hillsdale which only makes a mention of Eutaw Ave.
Further down on Liberty which becomes Pine at Holbrook line. Take left on Forest and right on Park. 2-3 cars at well hidden Hillsdale entrance. 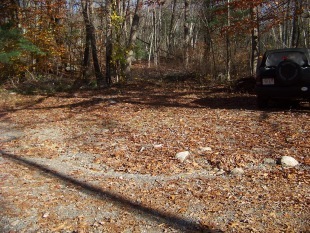 2-3 cars at Park st. end of Holbrook town forest. 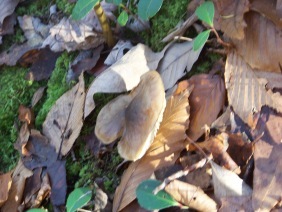 but littered and some slight to moderate grades near the pond.